Their timeless design, the fresh Mediterranean colors, the quality of the materials and the centuries of tradition make the roba de llengües fabric very captivating. An ancient Mallorcan craft, very few still produce this Mediterranean version of the ikat. Traditional without being nostalgic — they are a sign of Mallorcan identity. 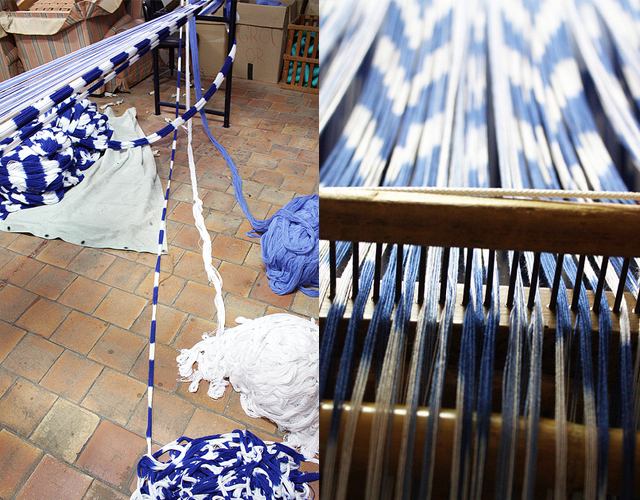 The origins of the tradition on the island of Mallorca are still unknown, although it is widely thought to be related to the oriental ikat — a Malaysian word that means to join or to knot. It is possible that ikat fabrics were brought back to Europe from Asia through the Silk Trade Route, and Mallorcan artisans adapted the technique to their own methods of weaving. 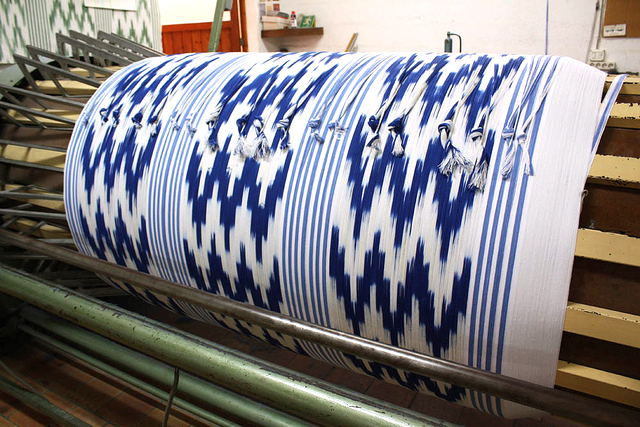 What is clear is that the llengües have become part of the vernacular Mallorcan crafts, with a clear set of styles, colors (azure, blue, green, red and yellow), and process of manufacture. The name given to these fabrics in the late 18th Century was roba de llengües which means “fabric of tongues” in mallorquín, possibly in reference the characteristic zig-zagged patterns. The old word used to describe this fabric was flàmula, which literally means “each of the different colored patches in a skein that are created by covering parts of it with absorbent rag paper tied with ribbons.” A word accurately describing the method used to make the fabrics. The process of creating the roba de llengües, consists of two meticulously complex phases. First, skeins are formed with threads of cotton and linen (with a ratio of about 70-30%). A mix of cotton and silk can also be used, but is now less popular. The areas of the skeins that are not going to be colored are reserved with a waterproof product. This is done so that when dipped in the dye, the color only covers a certain section of the threads in a discontinuous way. In spite of the impermeability of some of the sections, the dye partially filters through, creating the distinctive faded edge. 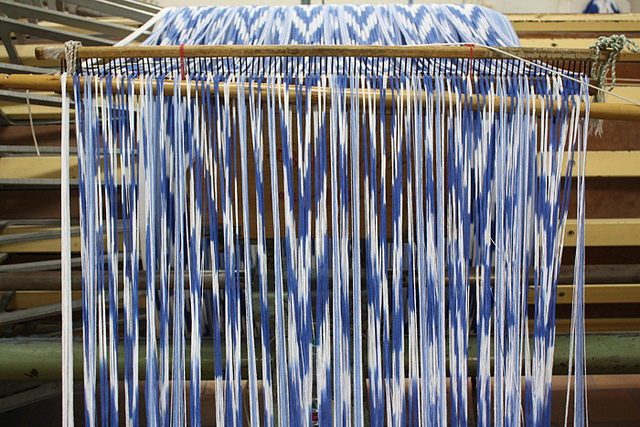 In the second stage of the process, the threads are released, the skeins formed and then woven. 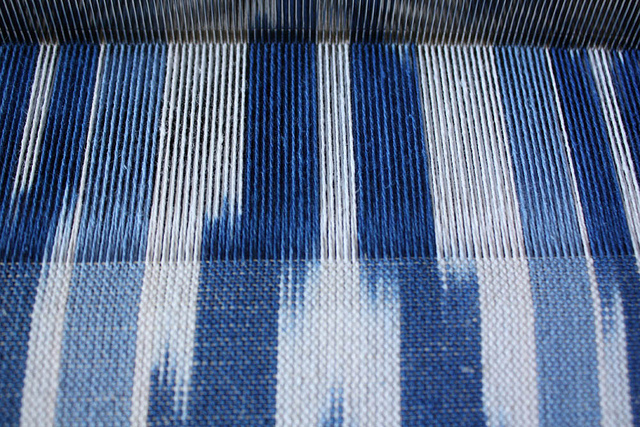 What makes the roba de llengües particular is that by dying the threads before weaving them they are completely reversible (something important to keep in mind when shopping for a roba de llengües or an ikat fabric: lower-quality imitations will be simply printed on one face of the textile). One of the few family-run companies still active today, Teixits Viçencs continues to make their fabrics in a very similar way than their ancestors did 150 years ago. They come from a family of textile manufacturers, and if you are ever on the island, we recommend a visit to their museum, where you’ll find a beautiful archive of this disappearing craft. 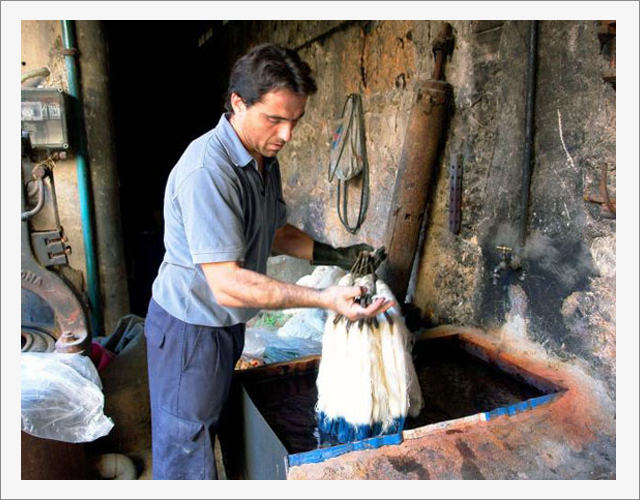 The photos in this post on the process of manufacture are all courtesy of Teixits Vicencs (except the one of man dyeing skeins). 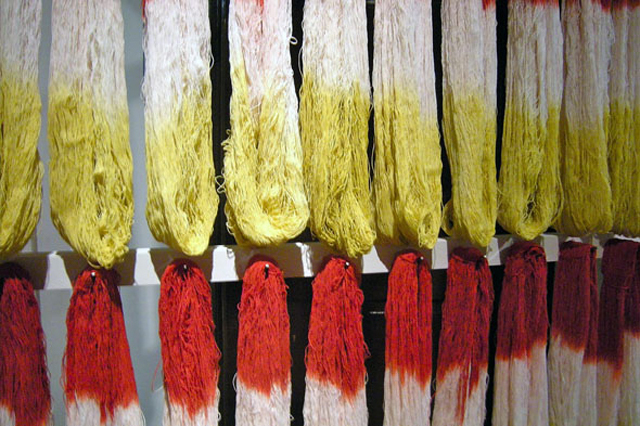 In the Twentieth Century natural dyes were replaced by artificial dyes and metal looms introduced. Despite these changes, the traditional process remains unchanged. Llengües fabrics are often used in interiors — I myself have fond childhood memories of a white and blue version covering our living room sofa in Menorca. 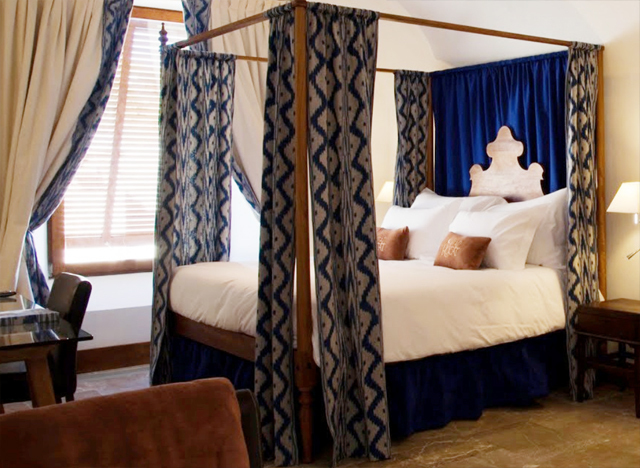 They fit in perfectly at simple-luxury hotel Cap Rocat, adding a bit of the island’s heritage without falling into topics. The roba de llengües has also found new applications — like these All-Stars created in a workshop by IDI and the Escola Superior de Disseny. The style never seems to fall out of season, as we have seen with the popularity of ikat prints on the runways, and brands like Missoni who have based their “look” on the zig-zag print. Hopefully, this new resurgence in popularity will help the small artisan industry not only stay alive, but to re-blossom. 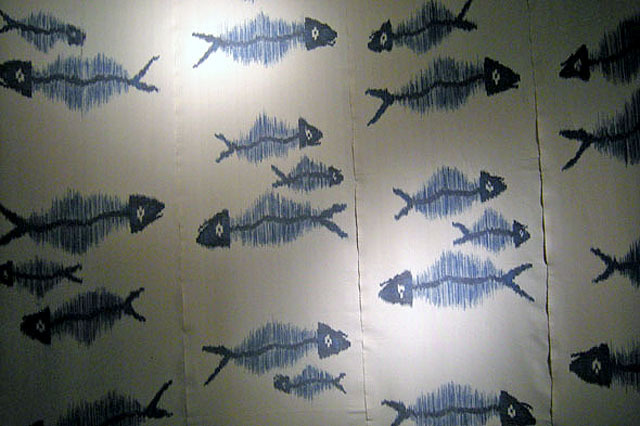 The popular Mallorcan artist, Miquel Barceló did a version of the pattern inspired in fish for an exhibition in 2009, appropriately entitled Flàmules. So many new and exciting applications of the llengües are still unexplored — we look forward to a creative collaboration between BiniChic and Teixits Viçencs somewhere in the near future. We have always been great fans of the llengües — and maybe after today — you will be too. This entry was posted in Uncategorized and tagged accessories, artisan, design, history, home, interior, Mediterranean, product, textile. Bookmark the permalink. I love this article, the photos are stunning. I’m going to post a link on my blog, hope that is okay. (If not, shout at me and I’ll remove it immediately). Of course! Thank you for sharing on your blog! So beautiful! I WANT THOSE SNEAKERS!!!!!!!!!!!!!! I know!! I’ll keep you posted if we get them on the BiniChic Store!